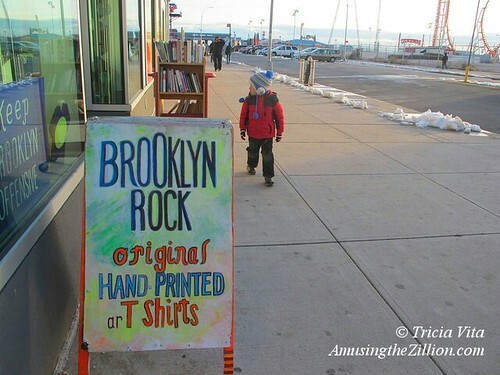 Mom & Pop art T-shirt shop Brooklyn Rock is out but not down. After 21 months in Coney Island, the arrangement they had with Thor Equities for space in the developer’s retail building at Surf and Stillwell has come to an end. The 1,500-square-foot store, for which they paid a percentage of income as rent, will be partly taken over by celebrity burger chain Wahlburgers, which is set to open its first New York franchise in May in the vacant restaurant space next door. 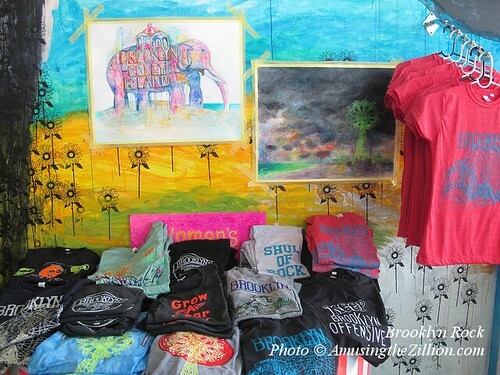 Before opening their Coney Island store in May 2013, the Brooklyn Rock team also wholesaled their merchandise to Coney Island USA’s gift shop, which they hope to do once again. Their previous retail shops include a street kiosk on Bedford Avenue, a shipping container at the now defunct DeKalb Market where Century 21 was built, and a Pintchik property across from Barclays Center, where foot traffic turned out to be slow. “When you’re an independent little guy, you’re swimming with sharks. We’re still swimming. We’re good. Ultimately we’re survivors,” says Braunstein. When ATZ interviewed Braunstein for the post that ran earlier this month, the shop had already received the vacate notice, but we did not mention it because they were hoping for an extension from Thor, as had happened last year. At that time, Luna Park offered them a kiosk in the amusement park, but they declined since they were able to keep their store. As for the vacant stores on the north side of Surf, where property owners have leased to restaurant and food businesses, Braunstein doesn’t think the location would bring them as much foot traffic as the south side of Surf. Tenants at Thor’s now fully-leased “Retail Ride of A Lifetime” building across from Stillwell Terminal include candy chain It’Sugar, apparel chain Rainbow Shop, the Brooklyn Nets Shop, Brooklyn Beach Shop spin-off Surf and Stillwell, and the soon-to-debut Wahlburgers. 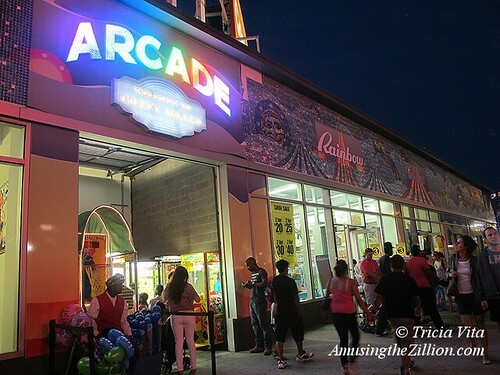 The building also had a Little Caesars Pizza pop-up last summer and two incredibly tiny mini-arcades, which are the shameful extent of the amusements required by the City’s Coney Island Comprehensive Rezoning Plan passed in 2009. It’s telling that in recent weeks ATZ’s top ten posts have been about IHOP, Wahlburgers and other chains coming in 2015. In addition to the already opened national chains and franchises such as Applebee’s, Rita’s Italian Ice, and Dunkin’ Donuts on Surf Avenue, a few new Mom & Pops like Lunatics Ice Cream and Luna Park Cafe opened last season. An outpost of Piece of Velvet, a cake and cupcake shop with locations in Fort Greene and Harlem opened on Valentine’s Day. On the north side of Surf, IHOP recently signed a lease to open a restaurant while Johnny Rockets remains under construction and Subway Cafe and Checkers have put their signs up and are almost ready to open. Sad to think that there are people who want Coney Island to be like every other place. Coney Island’s identity gets diminished when chain retailers become a very noticeable aspect of its offerings. We’ll find out soon enough when all of these new chainss are open. It’s very dispiriting to be writing about this so frequently but it is news. I wish instead we were hearing about a wave surfing venue or a pinball arcade opening in Coney Island! Because people love the chains. Simple as that. Coney will get its respect Lisanne. It hasn’t in about half a century. That is what is truly sad – Unfortunately it took half a century to rebuild. Times Square by the Sea is coming. No doubt about it. Coney has that type of potential. Many don’t believe it has that high a ceiling. It really does. Guaranteed. Personally I’m not looking forward to another burger chain, not even Wahlburgers..Could seriously care less. Too bad, but like Seth said, maybe they will give him a break somewhere else.. Piece of Velvet just opened two weeks ago. It has promise to pull people to Coney Island like Nathans does. There are only two other stores and seems to have a dedicated following. Walking by it today I saw several people park out in front, hop out to get something and get back in their cars and leave. This is winter of course. In the summer they may stick around. Unique things attract people to Coney Island. People wont travel here just to visit Applebees for example since there are plenty of them throughout the city. Add in similar places like TGI Fridays, absolutely no reason to make the trip to Coney. Unique things will, sameness never will.